Nothing makes a man look attractive than a well kept and maintained a beard. If you are not able to maintain a long beard, the best alternative is to keep it short by either shaving completely or just trimming. Well, you will need to use the best and reliable shaving gadget to ensure that your skin does not get irritation or bumps. For black men, you will need a good shaver that will be able to shave all your hair and still leave your skin feeling soft and smooth. In this article, we are going to discuss three of the best shaving gadgets for black men. 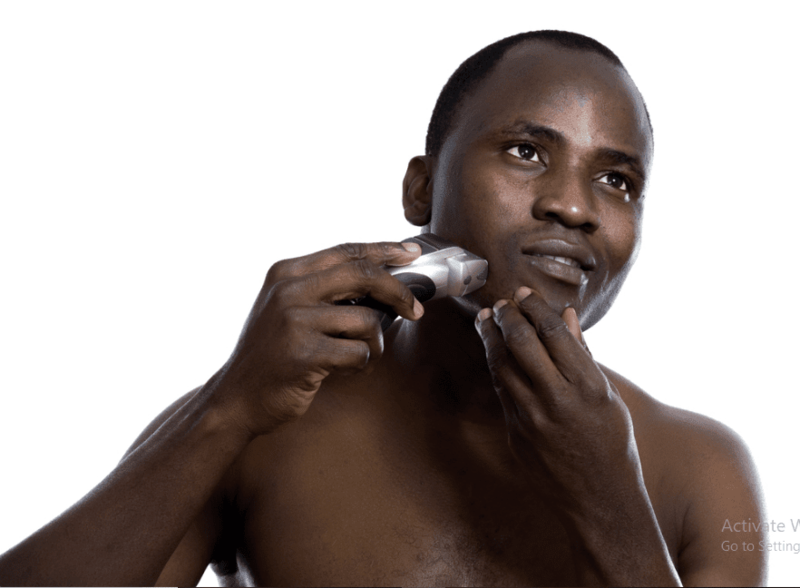 Which are the most common problems faced by black men when shaving? No matter the kind of razor you use when shaving a black man’s skin, it is bound to get scratched or even cut ones in a while. You may not notice it when shaving but once you are done and you rinse the skin with water, that’s when one feels the irritation. One thing that a lot of people don’t know or rather tend to ignore is the fact that the black men’s skin is quite sensitive due to the dense of the hair around the face and therefore, whenever they shave the skin, it gets irritation. The black men’s skin is not smooth and this leads to the development of razor bumps when they are shaving as the razor glides on their skin. Meaning, it adapts to every beard that is being shaved. 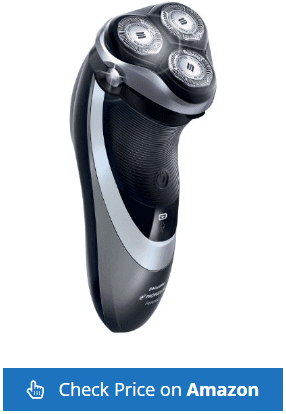 The gadget features a total of four synchronized elements which makes the shaving to be quick and fast. 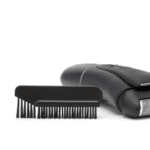 The gadget cuts the hair in one stroke, unlike other gadgets which make two strokes to make a good cut. Black men usually have a hard beard that may be a bit hard to capture for the first stroke. Therefore, the Braun 790cc shaver has been designed with a black man in mind since the sonic technology is added to the gadget in order to make sure that even the hard hair is easily captured. Another excellent feature that makes this shaving gadget to stand out from the rest is the presence of the active lift trimmer which makes sure that all the hair including the ones lying flat on the skin is easily and efficiently captured. 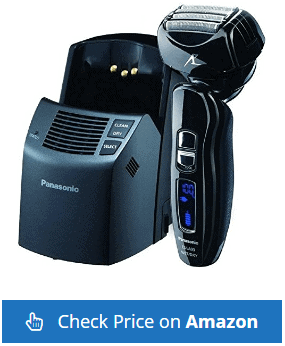 Whether you have light or dense beard, this gadget will give you an excellent finish thanks to the presence of the intelligent auto-sensing motor that makes it easy to shave all kinds of beards especially the dense ones. It is easy to control and set the shaver depending on your needs since it is equipped with five turbo sensitive modes which are ideal for adjusting the shaver to give different shaving options. Hence you can either select to have an extra power or a gentle shave depending on your needs. It comes with a pouch for easy carrying around and has a warranty for quality support purposes. This is the best shaver for all kinds of beard since it is able to maneuver and get to all the hair grains regardless of the quantity of your beard. This makes it safe and comfortable to use as well. The device takes one hour to change hence saving you time for charging. It adapts to different beards. Can be used to shave different forms of beards. Captures all beard on the skin. It does not come with cleaning tools. Panasonic has never disappointed when it comes to making quality gadget and this is no exception. 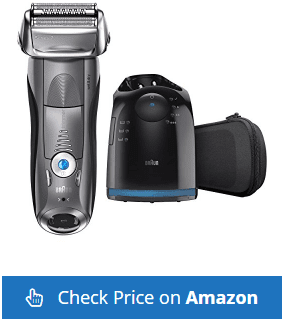 It was voted as the best men’s electric razor that is durable and efficient. 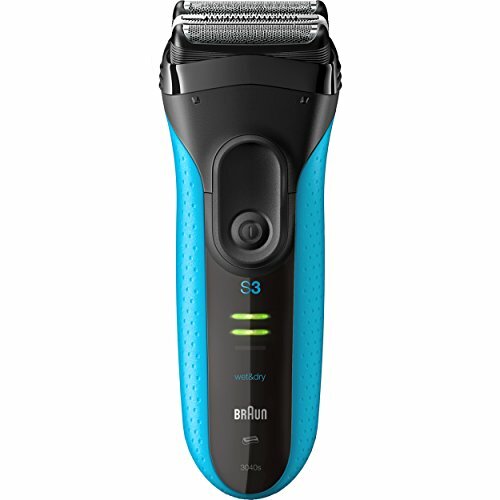 It is equipped with four blades which allows one to have different shaves and has a dual motor that ensures the blades stays sharp for a long time.It is quite fast which makes the shaving process to be quick as it can give about 14000 cuts in a minute. This is a flexible shaver that has a pivoting point thus allowing you to shave in different areas like the chin, sideburn, neck and also the jaw. When it comes to cleanliness, this gadget is designed in a magnificent way that enables you to completely eliminate all the hair that may be stuck on the blades. It has a control, button that allows you to clean and dry the device after the use. It has a sonic vibration cleaning mode that makes it easy and quick to clean the device after use. Whether you want to shave on a dry or wet skin, this device allows you to achieve it comfortably hence making it one of the safest shaver for all people including the ones with a sensitive skin. Other equipped features on the shaver include; a power indicator, cleaning replacement reminder four blades. Although this device may take time before you completely clean it, it is quite reliable as it is easy to use and save for people with sensitive skin. It takes less time to shave, unlike other electric shavers due to its ability to hold more hair at a given stroke. It can be used for both wet and dry shave. It takes an hour to charge. It has a flexible pivoting blade for easy shaving in different areas. The battery charge does not last for long. The cleaning process may take a long time. The shaver does not have an automatic shut off when the battery is full. Whether you want to have a dry or wet shave this model of shaver will offer just that. It is equipped with excellent features that make it qualify as one of the best shavers in the market. It is made with micro comb technology that catches and feeds more hair hence allowing you to take less time when shaving. It is waterproof such that you can wash the entire gadget with water without worrying about damaging it. It has a triple cutting system that gives three different cuts. It is compatible with the use of different shaving creams and gel since it still gives a smooth cut which leaves you with clear and non-bumpy skin. 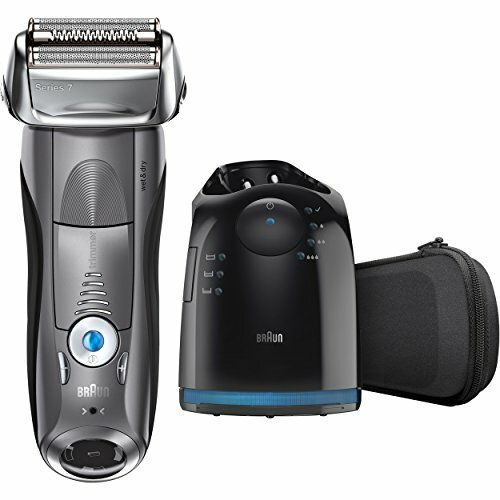 The shaver is packed with two rechargeable batteries which make it suitable for traveling. The shaver is ideal for those who are traveling since you can carry the two rechargeable batteries for interchangeable uses. Also, the shaver can be used with shaving cream or even gel and still gives excellent shaving results. It comes with two batteries for convenience. Suitable for both wet and dry shave. It does not come with a charger base. Has to be used with a cord. A good shaving device is determined by the features it has and therefore it is essential that you check on the components that the shaver has before you buy it. Also, considering that the black men’s skin is quite sensitive, you still need to find a shaver that is safe plus easy to use for safety and conveniences. The kind of battery that the device has is quite essential since it determines the time and also how long the charge will last. For example, some chargers take up to 12 hours to fully charge a shaver while other may take between 1 to 8 hours for the same. But keep in mind that the longer the charger will take before it fills the shaver’s battery, the more it will stay before the charge runs out. Meaning, a charger that takes 12 hours can give you up to 7 shaves while the one that takes around 1 hour may only give an emergency shave. So, choose the kind of charging power you need depending on your needs. 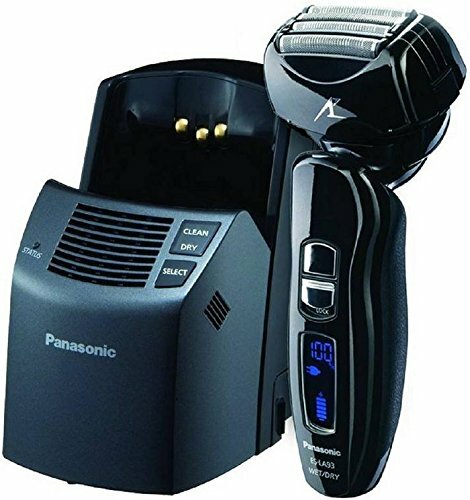 If you are prone to traveling, a shaver that stays for long before it runs out of power is the right choice. Overcharging or undercharging any kind of battery is not good as it tends to shorten the life of the battery. Well, as we all know electric shavers are not cheap and you will not want to buy shaver after every month. So to be on a safe side, consider buying a shaver that comes with an automatic shut off the battery. This will save you from the charger will always go off if the battery is full. Some shavers are equipped with a cord while others are made with none. If you are looking for a shaver that you can use from anywhere, be it a bathroom or at the bedroom, the best option is a cordless since it allows free, movements to different areas unlike the cord one where you will have to find a place for plugging. A shaver requires thorough cleaning so as to maintain the shaving blades in a good state and prevent them from getting an infection and become blunt. Since it is not easy to clean the blades manually, most manufacturers ensure that they pack the shaves with the right cleaning tools to make sure that one reaches all the areas that need to be cleaned. Therefore, choose such a device to make your cleaning process to be easy and convenient. Some shaving gadgets are designed for dry shaving others wet and also others are versatile where they can be used for both wet and dry shave. So, choose a versatile shaver that will allow you to shave your beard regardless of the state. Some people opt to shave their beard before they head to the bathroom and having a shaver that allows you to shave your hair before and after showering is quite convenient to use at any time. Sometimes you may want to trim your beard, grow it to a particular size such as a mustache or to trim the sensitive parts like on the sideburns. Note that not all shavers can be able to perform the trimming function and therefore if you may want to trim your beard instead of shaving it, make sure to choose a shaver that allows this. Some of the features to look for are the battery low notifications. This allows you to monitor the power of your battery thus enabling you to notice when it is about to run out for recharging purposes. Tips for comfortable black skin shaving. Use shaving lotion instead of soap. The face of a black man requires more than lather to prepare it for a shave. Due to the sensitivity of the skin, some shaving lotions are made with soothing ingredients which protect the skin from irritation by smoothening the facial hair before and after shaving. Therefore, a lotion is the right option to use. Clean and sterilize the shaver. Some of the reasons that a person gets an infection after shaving is due to the failure of cleaning the shaver well after use. Since it is quite easy to get a skin scratch when shaving a black man’s skin, it is advisable that you clean the blades and all the parts thoroughly and disinfect it with alcohol to kill all the germs. The blade tends to get blunt after long use. Instead of applying too much force in order to cut through the beard which may result to cuts and bruises, make sure to look for replacing blades available in the market once you notice it is getting blunt. Remember that you are moving a sharp object on your skin and this can easily cause you to make a cut or a scratch on the skin. As long your blade is sharp, you will not need to employ too much force when shaving which saves you from hurting your skin. After every shave, make sure to rinse your skin thoroughly and apply after shave lotion to smoothen your skin and keep it in a healthy texture. If you want the best electric shaver that is easy to use and that will mind your skin when shaving, consider the top three reviewed electric shavers. From the reviews, we can see that they are made of excellent elements that will make your shaving to be easy and they are comfortable to use as well. Follow the above guide to help you select the best shaver to use and the above-discussed tips will help you take the precautionary measures when shaving to ensure that you get the best results.